The suppression of the Thugs was another work of the time. 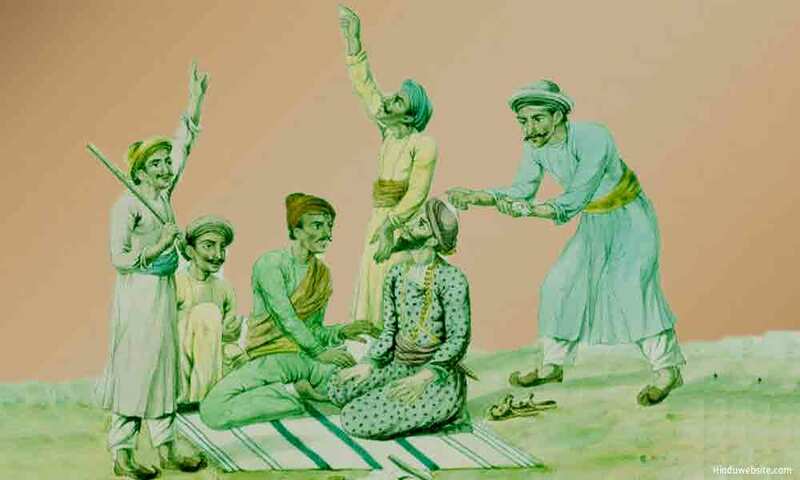 These detestable miscreants appeared to the outer world as honest traders or agriculturists, who occasionally went on pilgrimage or travelled for business or pleasure. In reality they were organised gangs of murderers, having a dialect and signs of their own. They made friends with other travellers going the same way; halted beneath the shade of trees, and suddenly threw their nooses round the necks of their victims, strangled them to death, rifled them of their money and goods, and buried them with a speed which defied detection. Sometimes the unwary traveller was beguiled by a female to a lonely spot, and was never heard of more. Every boy born of Thugs was brought up in what may be called the religion of the noose. From his cradle he was taught that he was bound to follow the trade of his forefathers; that, like them, he was the blind instrument of the deity of life and death. At first he acted as a scout; then he was allowed to handle and bury the victim; and finally tried his prentice hand at strangling. Before committing his first murder, one of the elders acted as his Guru or spiritual guide, and initiated him in the use of the noose as a solemn rite associated with the worship of the goddess Durga, Bowani, or Kali, the mythical bride of Siva, the incarnation of the mysteries of life and dissolution, who is often represented with a noose in her hand. Throughout his after career he adored the goddess as a tutelar deity; worshipped her in temples where Thugs officiated as priests; and propitiated her with offerings of flesh meat and strong drinks, which were supposed to be most acceptable to female divinity. The Hindus were too fearful and superstitious to suppress the Thugs. 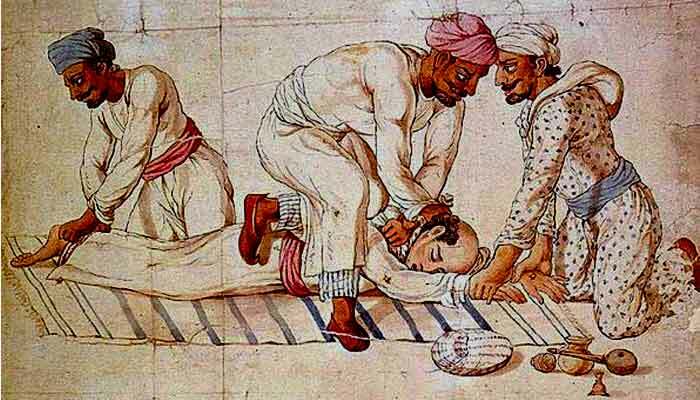 The Moguls had no such scruples, and often condemned Thugs to a cruel death; but wealthy Hindus would offer large ransoms to save their lives, or would follow the miscreants to the place of execution and regale them with sweetmeats and tobacco. When, however, the British discovered the secret organisation, they resolved to break up the gangs and put an end to the hereditary association. A department was organised for the suppression of Thugs, and chiefs and princes were called upon to co-operate in the work of extermination. Between 1830 and 1835 two thousand Thugs were arrested, and fifteen hundred were imprisoned for life, or transported beyond the seas, or publicly executed. Many saved their lives by giving evidence against their fellows, but were shut up for the rest of their days to protect them from vengeance, and to prevent their return to a horrible profession which had become an hereditary instinct in Thug families. 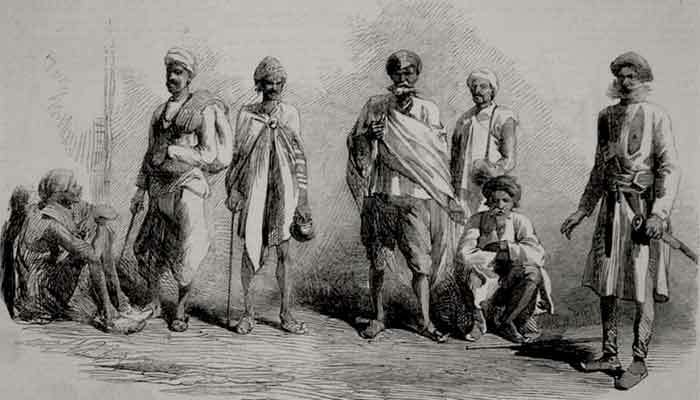 To this day the children or grandchildren of the old Thug gangs, who were the terror of India within the memory of living men, are manufacturing carpets, or working at some other useful trade, within prison walls.